I'm so glad that it worked out for you, Bane! You will be glad that you spent the money that you did so that something that you use every day will function properly! A nice easy hot shower is one of the best things there is about living in the developed world. Thanks! I think it was money well spent. A nice hot shower is indeed one of the best things! Yay! It's done! It looks great too! Success! One of the bathrooms in my parents' house also had the same kit. I think Price Pfister must have sold a gazillion of them. Yeah, sounds like management is trying to save water. I'm not convinced the low pressure shower heads are always the best idea. If it takes twice as long to rinse shampoo out of your hair, you're not saving water. Yaaay! I think you did the right thing by calling a plumber to do it if you werent sure. it looks nice and hurray! It works! Even though the plumber was expensive, replacing a plumbing valve wasn't something I wanted to attempt myself. (Plus I don't have the right tools.) In this case, it was better not to DIY. It looks so much more classy now and is even better to clean and use! What a nice upgrade for your home! Those little knobs were annoying even when they were working properly. 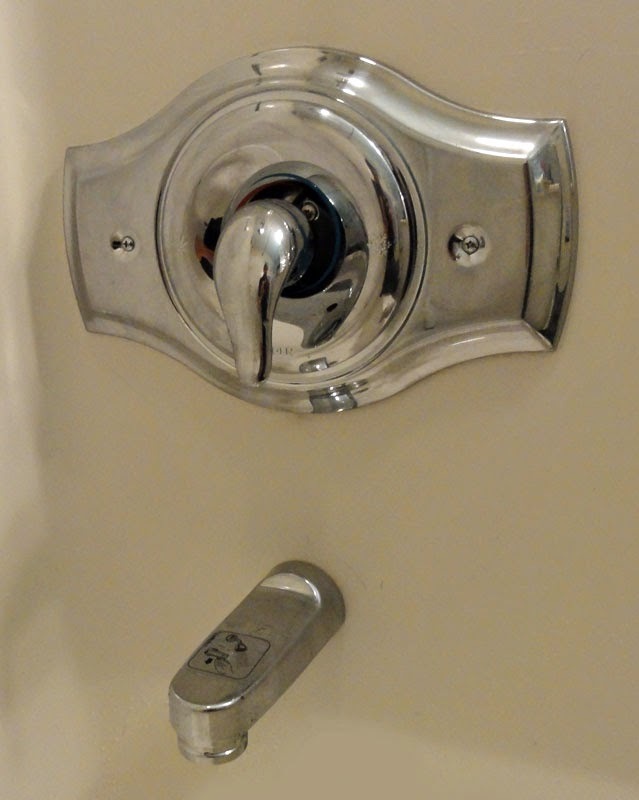 Changing to a handle that's easy to use has had a huge impact. So much better! Do you mind sharing the brand/source of your faucet and cover plate? They are beautiful! The cover plate is Premier Faucet Tub and Shower Remodel Plate in Brushed Nickel (133962) from Amazon.com. The faucet is Pegasus Estates 1-Handle Tub and Shower Faucet in Brushed Nickel from Home Depot. Looks like it has been discontinued, though.